When you buy chicks, most folks buy them sexed, for a whole host of reasons. Many folks can not have roosters in the city. Even if you can have roosters, too many are problems because of too much testosterone.I have heard many a story of a nice or good rooster. The only roosters I have had have been hard on the hens, and wanting to attack us and our dog. I would prefer not to have the hassle of roosters. For this reason I generally buy sexed, female chicks. Sexing is somewhere between 80-90% accurate. Even in the best case scenario you will sooner or later get a rooster or two. This year the jury is not in but we think we got two out of six. So if getting a couple of roosters was not a big enough surprise, I also got an unexpected breed. Instead of getting two Blue Laced Red Wyandottes we got two Blue Andalusian. That was the bigger surprise. I had never seen or heard of them before. I picked up my chicks when the regular chick lady was gone at the ranch supply. I thought the blue chicks they packaged up weren’t right. Wyandottes have a tendency to be mottled or chipmunk marked. My blue chicks were solid blue. Because the RLRW are somewhat rare, I did not question the staff, but assumed that my limited experience with these breed was the reason for the difference. The store was a couple of hours from the house, so at that point what was I to do, it was what it was. This is the male. He is a handsome fella, though they sport a single comb, something I stay away from due to the harsh climate here. So far he is a pretty pleasant fella. I’d like to hold on to him for awhile and see how he turns out. Here is the female. She was a lot more cooperative when trying to photograph her. They are eight weeks old right now. They are a pretty amazing blue color. What a fun surprise. Sunday was the day the littles (this year’s chicks) movec from the brooder in the garage out to a larger brooder area in the coop with the bigs (our existing flock). . We started the littles under the lights in a dog crate in the garage where we have fewer temperature fluctuations. The big drawback is even with the heat lamp and the overhead lights on, they get almost no sunshine. There is no scientific data, but I think that slows their development. Several times we have thought about moving them out to the coop but the last couple of weeks have been snowy and cold so we passed as much for ourselves as them. This week’s forecast is much better so we are moving them out of the garage. RangerSir got the set up ready for them.It takes some set up time to get a warm safe, draft free space set up for them in the coop. They need to be protected from the bigs. We have been doing this now for awhile and know the routine. It is a combination of a dog exercise pen, a dog crate, heat lamps, chicken wire top, and some kind of draft protection (this year plywood, some years it is cardboard.) This set up will do for the next stage of their life. I am not sure where the time went since I last posted. I finished up technical job that took more effort than I planned but was also more fun than I imagined. It had a hard deadline and so my focus was pretty narrow. I have now run the job back to employer, and I am done with that job. I don’t have another one right now so and I am catching up on some things that got put aside one of them my blog. Excuses given my major news is that I did get chicks this week. RangerSir and I agreed that we bring in a few every year and this year did not have a good reason for not doing so. I got all Wyandottes, one of my favorite breeds. I love them because they lay well, they come in assorted colors and designs, when they are done laying they can be sent to freezer camp, and they have a cushion comb which is really nice during a Montana Winter. I only got six, which is our optimum flock size. I got two blue laced reds, two golden laced, and to silver laced. 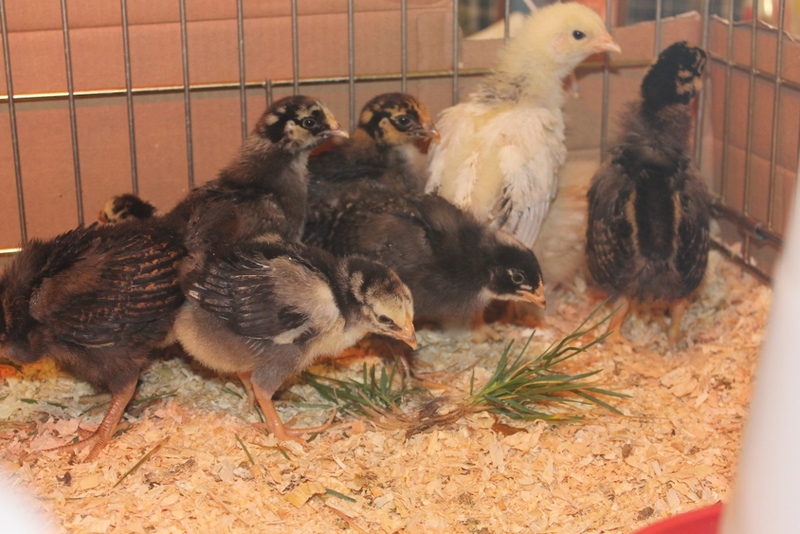 Right now they are in a brooder under the lights in the garage. Right now they are in the brooder under the red heat lamps. This is the first time they have not spent the first two or three weeks in a brooder in the house, but enough is enough. We are finding it more of a challenge than we had figured on to keep them warm and keep them confined. This two will pass and each week will get better. In spite of all the changes going around here, we are still backyard chicken wranglers. We decided to get some chicks again this year. Last year’s chickens for some reason were the worst foragers we have ever raised. We would open the door on the chicken run in the morning for them to head out and be free ranging chickens eating seeds, bugs and scratching in the dirt looking for all sorts of tasty morsels. This was something every previous flock was gun hoe and very good at. Instead this flock insisted on staying in the coop, lazing around and eating chicken feed. It made no sense to me, they were breeds we had had before that had demonstrated their ability to get most of their diet in the summer out in the pasture. I seriously thought about locking them out of the coop, but they would need access to lay eggs, so that was not really a feasible alternative. It was frustrating as the locally milled organic food was not as inexpensive as commercial chicken chow was, and they went through more than twice as much as prior flocks have. On top of that chickens who stay close to the coop make for more clean up. If they free-range out in the pasture, no one cares where or how much poop a chicken can generate. And chickens do generate poop. The chicks are showing an interest in eating the grasses already at two weeks. This year I have ten chicks and I am hoping for good free-range foragers who like to get out and look for their dinner as much and as long as they can. To this end they are just two weeks old and I am already pulling little cheatgrass plants and feeding them to the new chicks roots and all. The chicks are showing interest in picking at the grasses and do lots of chirping and digging around when I add that to their cage each day when I clean it. If you are wondering who cares if they free range or not, here is a little information that you may not know about free-range, pasture raised eggs according to tests done by Mother Earth News comparing commercial eggs vs. the eggs from chickens that actually get out and free-range in the pasture. My chickens who get outside daily to eat grass, dandelions, bugs, grubs, seeds, and what ever other goodies they can find and with a good dose of daily exercise produce eggs that have • 1⁄3 less cholesterol• 1⁄4 less saturated fat• 2⁄3 more vitamin A• 2 times more omega-3 fatty acids• 3 times more vitamin E• 7 times more beta carotene. Yes there is a difference in eggs. Keep your fingers crossed that this year’s finds their natural instincts and the become the mighty forager’s that commercial chickens can not imagine is even possible. This is a dilemma I have almost every year when I think about baby chicks for the upcoming year. It used to be that ordering mail order was the only way to go, because I wanted one of eight or ten different fairly unusual breeds. Now after years of trial and error, experience has been a teacher that has taught me well. I am much more likely to do the feed store run when they have most of what I want. I still want cute and usual, but have discovered that the practical side of me has become the side that I listen to now. Combs ~ I have learned that I really prefer to take birds with cushion or pea combs through the winter. Montana winters are just too harsh on the little points on the single combs. 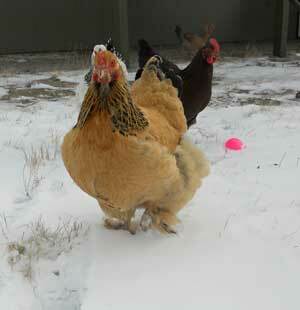 My chickens don’t let the snow of winter stop them from foraging. Here is a Brahma hen with a pea comb. There is a Buckeye in the back with a single comb. Size ~ All my layers ultimately end up in the soup pot, so a scrawny chicken is just a lot of trouble for very little meat in the end. So super layers with almost no body are not the kind of breed you will find in my coop. Forage Qualities ~ My chickens are not only allowed, but they are encouraged to free range and supplement their diet with bugs, slugs, greens and seeds they find naturally out around my house. For this reason I like breeds that have enough of the natural instinct in them to get out do the job well. It is not fool proof because sometimes a breed with a history of being a good forager will not do so well one year. Not sure why that happens, but it does. Egg Laying ~ I became a backyard chicken wrangler for the eggs, so I always want something that lays well. No Plain white ~ It makes them too easy of a target for predators and besides I am not giving up completely on cute. Nix to meanness ~ Any chicken who turns out to be mean makes an early trip to freezer camp. Period. Based on this you are likely to find Wyandottes in my flock every year, sprinkled with some other near misses that manage to come close to matching my criteria that I keep going back to: Barred Rocks and Buff Orpingtons in spite of the single combs and Brahmas even if they don’t lay the best. If I lived some place a with a little less severe of winters my choices would likely be something else, so remember if you are starting out it will be trial and error based on your situation. Don’t be afraid to experiment a little.